Gov. Rick Scott announced today that he is going to push to raise the firearm purchase age in Florida from 18 to 21 years old in the wake of the deadly school shooting last week. “Change is coming, and it will come fast,” Scott said today. Scott, a Republican with an A+ rating from the National Rifle Association, announced the age increase as part of a series of steps he wants the state to take on gun laws, school safety and mental health. He started his news conference today by reading the names of the 17 students and school staff who were killed at the Feb. 14 shooting at Marjory Stoneman Douglas High School in Parkland. “Unfortunately, none of the plans I’m announcing today will bring any of them back, but it’s important to remember them. The 17 lives that were cut short and all the hopes and dreams that were ruined have changed our state forever. Florida will never be the same,” Scott said. Florida Governor Rick Scott lays out his school safety proposal during a press conference at the Florida Capitol in Tallahassee, Fla., Feb 23, 2018. He called for the institution of what he termed a violent threat restraining order — similar versions of which are in place in some other states. The order would allow a court to stop a mentally ill or violent person from buying a gun after a family member, community welfare expert or law enforcement officer files a request to instate the order. “I want to make it virtually impossible for anyone who has mental issues to use a gun. I want to make it virtually impossible for anyone who is a danger to themselves or others to use a gun,” Scott said. Assistant Principle Denise Reed (R) hugs a school employee as teachers and staff are allowed to return to the school for the first time since the mass shooting on campus on Feb. 23, 2018 in Parkland, Florida. Scott also called for a strengthening of the restrictions that should stop mentally ill individuals from buying guns. The age hike that would stop someone from buying a gun before they are 21 years old would have exceptions “for active duty and reserve military and spouses, National Guard members, and law enforcement,” Scott said. Scott’s list of proposals also included an outright ban of bump stocks, which were not believed to have been used in the Parkland shooting but gained infamy following the deadly shooting at a Las Vegas concert in October. He also detailed his plans to increase security precautions and training at schools. He said that he will push to have more law enforcement officers at schools, suggesting that there be at least one law enforcement officer for every 1,000 students. Scott also called for a mandatory implementation of active shooter “code red” drills at the beginning of each semester at public schools. 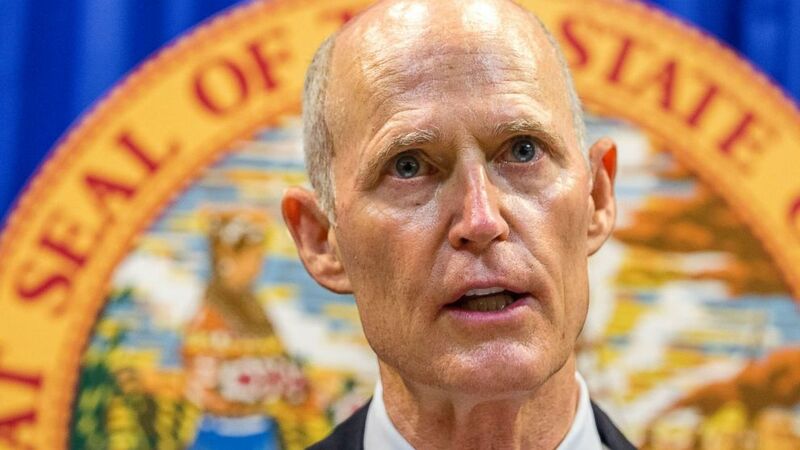 Scott said that he and Florida lawmakers would be discussing the plans in Tallahassee, the state capital, during the next two weeks while the state government is still in its legislative session. “I will not accept the old, tired political notion that we don’t have enough time to get anything done. Government does not have to be slow or lethargic. And when it comes to protecting our schools and our kids, we need to be swift and decisive,” Scott said. The announcement comes the same morning that some staff members returned to Marjory Stoneman Douglas High School, nine days after the shooting. Teachers were seen hugging as they arrived back at the school in the wake of the Valentine’s Day massacre. People arrive at Marjory Stoneman Douglas High School as teachers and staff are allowed to return to the school for the first time since the mass shooting on campus, Feb. 23, 2018 in Parkland, Florida. Marjory Stoneman Douglas High School assistant principal Denise Reed hugs a school employee as she returns to the school, Feb. 23, 2018. Staff members had the option to go back to the school today and all staff is expected to return on Monday and Tuesday for planning days ahead of classes, Broward County Public Schools said. “A variety of support services” are available, the district said. The school district, calling this an “emotional and difficult recovery process,” is also holding a voluntary campus orientation for students and parents Sunday afternoon. Classes for students will resume on Wednesday with a modified, shorter schedule for the week, the district said.